Step in our direction and walk the trails, ramble along the pathways or climb the summits. The most popular short (and steep!) walk in the Adelaide Hills runs from Waterfall Gully carpark around 8 kilometres east from Adelaide through Cleland Conservation Park to Mount Lofty Summit. The 3.8 kilometre trek passes cascading waterfalls, scenic gorges and lush fern gullies brimming with bush birds and wildflowers. At 710 metres above sea level Mount Lofty Summit at Crafers affords spectacular views of the city and coast beyond. It’s the ideal place to start your Adelaide Hills adventure to get your bearings and appreciate the elevation that characterises the region. There is a café and restaurant at the site, as well as a Visitor Information Centre with souvenir shop. For those preferring a gentler walk we recommend the trail from Crafers to Mount Lofty Summit. Walking SA offers some good information about these and alternate routes here. At approximately 22 kilometres long, the Pioneer Women’s Trail between Verdun and Beaumont is designed for walkers mainly following country roads, laneways and bush tracks through a delightful section of the Adelaide Hills with historic homes, deciduous trees and native bushland. The Pioneer Women’s Trail honours the early European settlers from Hahndorf who supplied Adelaide with fresh produce at a time when most other foodstuffs had to be imported into South Australia. South Australia’s 1,200 kilometre Heysen Trail extends from Cape Jervis, on the Fleurieu Peninsula, to Parachilna Gorge, in the Flinders Ranges, traversing coastal areas, native bushland, rugged gorges, pine forests, vineyards, rich farmland and historic towns. It caters for both the serious backpacker hiking the entire trail and for walkers doing day walks along shorter sections. The trail runs through the Adelaide Hills, taking in places such as Mylor in the South, a detour to Hahndorf (home of Sir Hans Heysen for many years), Mount George, Piccadilly, Cleland Conservation Park, Norton Summit, Morialta and Montacute Conservation Parks, Cudlee Creek, Chain of Ponds, and Mount Crawford Forest Reserve in the north. The Friends of the Heysen Trail provide detailed information on their website. The Heysen Trail is closed during the Fire Danger Season (November to March), with closure dates varying across the trail. The Yurrebilla Trail is an interpretative bushwalking trail through the Adelaide Hills traversing some of South Australia's most spectacular and interesting landscapes and providing a link between national and conservation parks in the central Mount Lofty Ranges. The trail is 54 kilometres long and can be walked in its entirety in three days. Ranging from narrow single-person tracks to vehicle fire tracks, the Yurrebilla Trail passes many of the Adelaide Hills' top tourist attractions, including Waterfall Gully, the Mount Lofty Botanic Gardens, Mount Lofty Summit and Cleland Wildlife Park. It also visits or has connection to picturesque towns such as Summertown, Crafers and Norton Summit, as well as wineries, pubs and other attractions. There's also plenty of accommodation along or near the trail, ranging from bed and breakfasts to pubs and youth hostels. The Yurrebilla Trail connects directly with the Heysen Trail for 12 kilometres, joining between Mount Lofty and Third Falls in the Morialta Conservation Park. Belair National Park features a series of shared use trails that are used by walkers, cyclists and horse riders. Cleland Conservation Park also has many fire tracks and shared use trails from which cyclists can enjoy spectacular views of the Adelaide Hills and surrounds. features a series of shared use trails that are used by walkers, cyclists and horse riders. Cleland Conservation Park also has many fire tracks and shared use trails from which cyclists can enjoy spectacular views of the Adelaide Hills and surrounds. Hahndorf Walking Tours offers leisurely guided walks exploring the unique village of Hahndorf. Step back in time to the settlement of Hahndorf and the life of the Prussian immigrants who came to South Australia to escape religious persecution. Walks are 90 minutes and approximately one kilometre long. 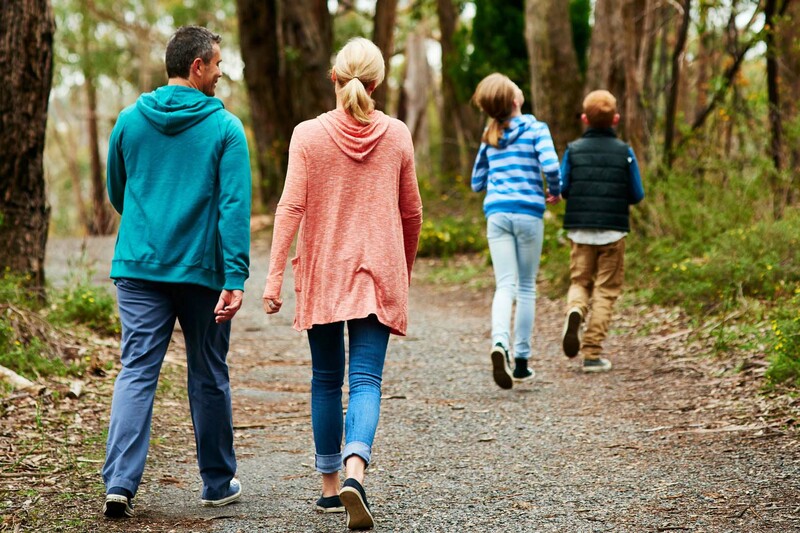 There's more than a day's worth of walking trails in the region so why not spend the night in the Adelaide Hills and wake up in a cosy cottage, family cabin, luxury villa or boutique hotel? Check out our extensive range of accommodation which can be booked online.